In the previous review of the ‘Pre-War’ developments of quantum mechanics, we saw that there were aspects of the theory that had begun to invoke much philosophical debate about the true nature of reality, at least, at the quantum level. While this debate has still not really been resolved, see Quantum Philosophy, we probably need to initially review some of the mathematical and scientific developments prior to any further reflection of the philosophical issues. However, even when the context is confined to the particle models, the discussion of quantum physics can quickly become pre-occupied with the discussion of many paradoxes, which are often generalised in terms of ‘quantum weirdness’. As such, it is all too easy to lose sight of any ‘objectivity’ in such esoteric discussions, before coming to any real understanding of the basic concepts. Therefore, this section will initially try to focus on what was possibly the most important aspect of quantum physics in the initial post-war years, i.e. the development of the sub-atomic particle model. In many respects, the foundations of post-war quantum physics is based on many ideas contained within a description called ‘quantum field theory (QFT)’. The totality of QFT is really a specialist subject in its own right, but in terms of this general introduction, it will be described in terms of an overarching theory, which in-turn encompasses many other theories, which might be said to substantiate the standard particle model. In this context, quantum field theory sought to answer questions as to how and why an atom radiates light in the form of a photon, i.e. when an electron transitions between orbital energy states. Einstein himself called this process ‘spontaneous emission’ as early as 1916, but had no way to calculate its rate as this issue required the development of a relativistic quantum theory of electromagnetic fields, i.e. a quantum theory of light. Of course, quantum mechanics is also a theory of matter and so quantum field theory must encompass not only the original idea of electromagnetic fields, but also the notion of quantum fields, which were to be subsequently proposed. How would quantum fields come to underpin a particle model? Based on the original pioneering work of Dirac, a new approach to a quantum field theory called Quantum Electro-Dynamics (QED) was developed, in 1947, by Richard Feynman, Julian Schwinger and Sin-Itiro Tomonaga. In essence, this variant of QED would side-step the known problem of infinities via a process called ‘renormalization’ in order to generate finite results. Despite certain reservations in this methodology, QED was shown to provide predictions of the interaction strength between an electron and a magnetic field that were experimentally confirmed to a precision of two parts in 1012. However, in the process, QED also initiated many other speculative ideas concerning the nature of empty space, i.e. the vacuum, which some initially considered to be ridiculous. For example, it was suggested that empty space is not empty, but rather filled with small, fluctuating electromagnetic fields, which were said to explain Einstein’s idea of spontaneous emission. So did experimental data support this approach? In the pre-war era, quantum mechanics was able to make accurate predictions within the realm of low energy physics. However, in the post-era, experiments started to involve energy levels that increasingly required relativistic effects to be taken into consideration. In this context, QFT was seen as a better methodology in which the original ideas of quantum mechanics could be reconciled with special relativity, which might then help explain the existence of two fundamental classes of particles, i.e. fermions and bosons. However, the original scope of QED was primarily focused on a class of particles called leptons, i.e. electrons and photons, as it did not seem to adequately describe another class of particles called hadrons, which included protons and neutrons plus a more complex sub-class called mesons. Subsequently, a new theory called Quantum Chromo-Dynamics (QCD) would be developed in order to explain these different classes of particles. In QED, the force between charged particles, such as the electron, is said to be ‘mediated’ by photons; while QCD expands on this description to explain how the force between quarks is ‘mediated’ by gluons. While there were obvious similarities of approach, QED and QCD were distinct theories that might be said to sit under the umbrella of QFT, which in combination started to provide the foundations of the ‘standard model’. In this context, QFT started to explain the plethora of elementary particles being discovered due to the advances in experimental physics. Were there any other important theories at this time? We should also introduce the idea of the electro-weak theory, which started to be outlined in the early 1970’s. This theory would help unify the interaction of the electromagnetic and weak nuclear forces, which had initially appeared quite distinct. For example, the weak force only acts across distances smaller than the atomic nucleus, while the electromagnetic force can extend to great distances, e.g. the light from the stars, which when described as a radiation weakens with the square of distance. 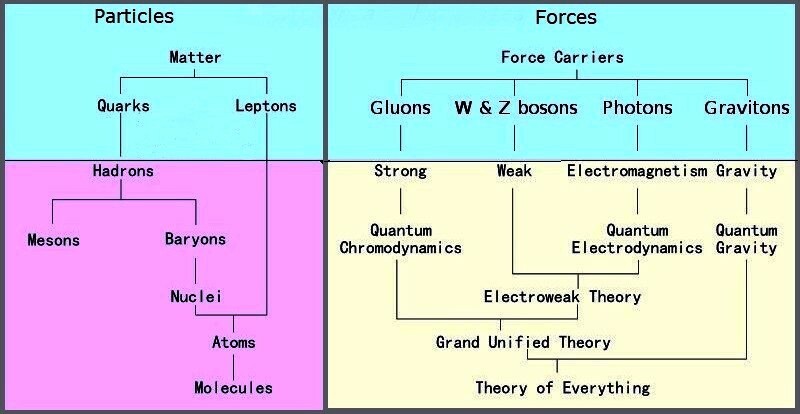 More importantly, the strength of these two fundamental interactions between two protons reveals that the weak force is some 10 million times weaker than the electromagnetic force and therefore it was a major discovery that these two forces are but different facets of a single, more-fundamental electroweak force. As such, the electroweak theory developed out of the attempts to produce a self-consistent ‘gauge theory’ for the weak force, which would be analogous to quantum electrodynamics (QED). The discovery of the W and Z bosons, in 1983, provided the experimental verification of particles that had previously been predicted by the electro-weak theory. So, the photon that accounted for the electromagnetic interaction was now complemented by the W and Z bosons in order to unify both the electromagnetic and weak interactions. So is the particle model now a complete theory? Today, the quest to understand the ultimate nature of matter is an on-going goal of research, which has been compounded by some very speculative assumptions in the field of cosmology. In this context, normal matter particles that dominate the current periodic table only account for 4% of the energy-matter of the universe, while the remaining 96% is described in the form of dark matter (23%) and dark energy (73%). Unfortunately, at this time, there is no definitive description of either dark matter or dark energy within the standard particle model. As such, theoretical physics may still have to come up with some fairly radical ideas in the 21st century.